Isle of Palms is located just 20 minutes from downtown Charleston, on the Atlantic Ocean side of Mt. Pleasant. This is one of the most affordable beaches in Charleston, which is often surprising to home buyers because of its popularity and overall upscale atmosphere. Although much of the real estate consists of vacation homes, you'll find plenty of residents and community events year-round on IOP thanks to the City of Isle of Palms and its fantastic Recreation Department. Isle of Palms has a much larger selection of newer homes compared to the other Charleston beaches, and you'll see lots of houses built in the Low Country and Charleston styles. Most of the condos on the island are located within walking distance of the small downtown area which has a Ben and Jerry's Ice Cream, beach shops, and the Windjammer (a beach bar that often has live bands). More entertainment options are just a 5-10 minute drive to Mt. Pleasant, which has 2 movie theaters and tons of shopping and restaurants - including Target, Barnes and Noble, and Whole Foods, just to name a few. This marina is located on Breach Inlet, just behind the Boathouse seafood restaurant. 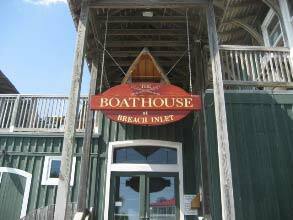 Although the marina is private, the Boathouse owns several of the dock spaces for customers to dock their boats while they eat. 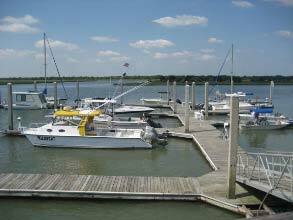 You'll find a larger marina (the Isle of Palms Marina) located on the other side of the island. It has a boat ramp that is open to the public but charges a fee to use. 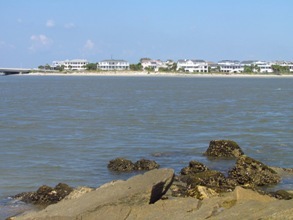 Breach Inlet (pictured below) separates IOP from Sullivan's Island and is a popular route for boaters. Its proximity to the Atlantic Ocean has also proven useful in history. In 1864 the submarine H.L. Hunley departed from Breach Inlet on its mission to sink the Union ship U.S.S. Housatonic. Although the Hunley was successful, the submarine also sank in the process. The wreck was recovered in 2000 and is still being restored. The most popular stretch of beach along Isle of Palms is the area surrounding the pier. You'll find several beach accesses and condo buildings as well as the small downtown area all within easy walking distance of this section. In general, parking at Isle of Palms is very convenient compared to most of the other Charleston beaches, making it the preferred beach to visit among Mt. Pleasant residents. 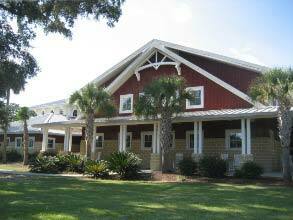 The Isle of Palms Recreation Department is centrally located on the island and offers a large playground, a soccer field, tennis and basketball courts, a picnic area, a dog park (called Bark Park), and softball and baseball fields. The Rec Dept hosts youth and adult sports leagues, tournaments, and afternoon events ranging from basketball to ping pong to dodgeball to flag football. Inside the Recreation Department, there's a cardio workout room, a gymnasium, and rooms used for the many classes offered year-round for children, teens, and adults. There are too many programs to name them all, but some of the options include Tae Kwon Do, salsa dancing, guitar, yoga, and zumba. If you're looking for a beach home to live year-round, Isle of Palms is a good area to consider because it has a relatively active City Council and Rec Dept compared to most of the other Charleston beaches and resorts. The Windjammer is a beachfront bar that's been around since 1972. It's a favorite among locals and often hosts volleyball during the day and live bands at night. Its musical tastes are eclectic and range from beach music to cover bands to local Charleston and South Carolina musicians like Edwin McCain. 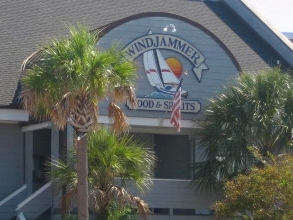 The Windjammer is located on Ocean Boulevard, which is the main road through downtown Isle of Palms. The Isle of Palms Marina is a full service marina with 50 boat slips, wireless Internet, cable tv, private showers, secure floating docks, and a double-wide public boat ramp. 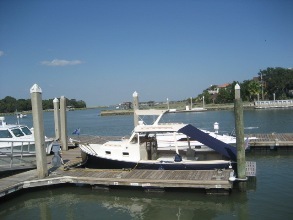 Its location on the Intracoastal Waterway makes it one of the most popular marinas in Charleston. In this section of IOP, you'll also find Morgan Creek Grill (which serves steaks and seafood) and Ted's Dockside (a very well-stocked bait and tackle shop that also serves less formal breakfast and lunch). The main recycling center for Isle of Palms is also located within this commercial section of the island. Real estate on Isle of Palms mostly consists of condos and houses with very few townhouses available. Many IOP home buyers also consider Wild Dunes since this private, gated beach resort is located on the northern tip of Isle of Palms. Condos are ideal for buyers wanting real estate under $800K because you'll get an overall nicer home that's closer to the ocean. Condos are also good options for second homes because they require little to no upkeep throughout the year. 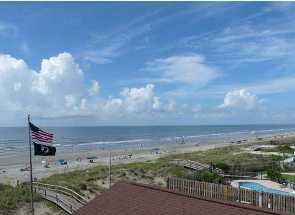 Some of the most popular condos on Isle of Palms are Oceanside, Sea Cabin on the Ocean, Seaside Inn, and Oceanview Condominiums. Condos are the only beachfront homes you'll find under $1 million on Isle of Palms, since houses in this price range will be several rows back. 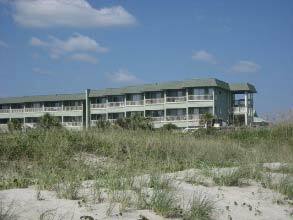 The 2 main options for beachfront condos are Sea Cabin on the Ocean (pictured) and Seaside Inn. Both of these communities have pools, and Seaside Inn also has an elevator. Beachfront houses on Isle of Palms start around $1.8 million and go up to about $9 million. In the higher price ranges, many of these houses have their own private pool overlooking the ocean. Isle of Palms is one of the best beaches to consider if you're looking for newer construction houses, since these make up the majority of real estate listings. The homes located several rows back from the ocean offer more affordable options for houses, and most of these are just a few minutes' walk to the beach. More than 50 public beach accesses are located throughout Isle of Palms, making it one of the most easily accessible beaches in Charleston. Many of these homes a few rows back still offer great views of the Atlantic Ocean to the east or the marsh and creek to the west. Although only seven miles long by one mile wide, the Isle of Palms is home to almost 5,000 full time residents. Each year, the island sees anywhere from 20,000 to 50,000 visitors. Along with Sullivan's Island and Folly Beach, the Isle of Palms ranks consistently as one of the Lowcountry's favorite vacation spots, offering beautiful sandy shorelines and a friendly, relaxed atmosphere. Popular with visitors and residents alike, the numerous activities, picturesque scenery, and easy access make Isle of Palms an unforgettable vacation getaway or a peaceful home retreat. As with many of Charleston's neighboring communities during the 19th century, the Isle of Palms started as a popular getaway destination. Affluent Charlestonians would spend summer days away from the heat and congestion of downtown at the Isle of Palms, as well as at Sullivan's Island, Mount Pleasant's historic Old Village, and Folly Beach. After Mount Pleasant was connected to the downtown community via the Grace Memorial Bridge in the 1920's, development on the Isle of Palms followed soon afterwards. Today, the Isle of Palms is a vibrant municipality to itself located fifteen miles from downtown Charleston. Mount Pleasant can be easily accessed within minutes via the Isle of Palms Connector. 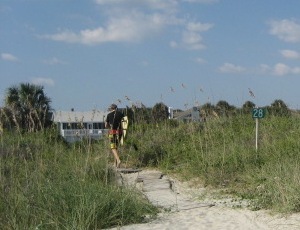 Sullivan's Island (another barrier island beach) is located directly to the south of Isle of Palms. And, the northern tip of the Isle of Palms is gated off for Charleston's most popular beach resort, Wild Dunes. In 2002, the City of Isle of Palms was the first in South Carolina to achieve the Blue Wave Designation from the Clean Beaches Council, which recognizes environmentally well-managed beaches. The city has successfully kept this designation every year since.